I thought the best was turkeys in trees, but I do believe that a turkey on the roof wins. And to be honest, they probably aren't that far off course judging by how many wild turkeys we get up north every year. LOL! Yeah, a turkey in a tree would be equally ridiculous. At first, I was worried about that first one I saw up there. I mean, I knew they could fly, but they don't fly all that well. I was afraid she'd gotten up there, and was afraid to come back down (like a kitten up a tree). I honestly do wonder if all that noise she was making wasn't her calling for help. Or at least for her homies to come and join her. When Connor and I left for school, there weren't any other turkeys in sight; they had showed up by the time I got home. Maybe in response to her calls? In any case, they're not up there now, so apparently they were able to get down. And thank heavens. 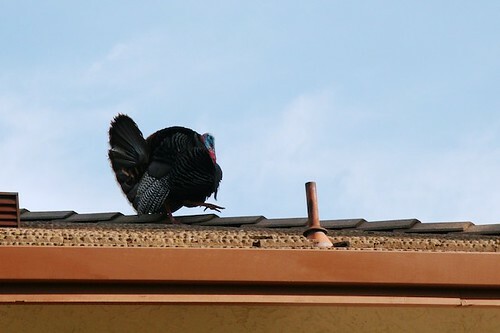 I am definitely not up to a turkey rescue which involves climbing up on the roof. She'd have been stuck there.